We’re always looking for ways to improve the flow of traffic on our highways and that is why we are happy to announce a new flow for commercial traffic, effective March 19, 2012. Under a one-year Travel Times Pilot, we’ve adjusted the travel times for commercial vehicles and loads travelling under permit in B.C. Those changes state you can travel any time on any day apart from a few exceptions (times when general traffic volumes on the heavier side). 1) It simplifies the hours of travel rules for commercial traffic 3.2 metres to 4.4 metres wide. 2) It sets out the conditions and restrictions for travel hours in a driver-friendly way. 3) It results in a net increase of travel time for vehicles/loads under permit. 4) It increases flexibility for carriers and drivers when scheduling travel and rest times and helps them meet hours of service obligations. Did you know that the net gain in travel hours available for loads 3.21 m to 4.4 m wide is about 15 to 25 hours weekly. That’s a huge value for industry! Safety is another big benefit of this project. By diverting some oversized commercial vehicles away from tourist and recreational traffic on weekend evenings, we hope to minimize congestion and increase safety on our roadways. Your feedback on the pilot program is welcome! 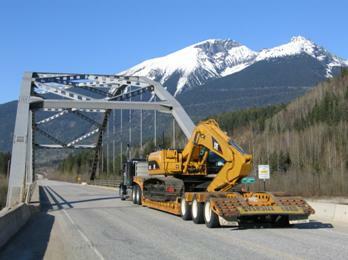 Please contact us at Commercial.Transport@gov.bc.ca for quarterly review. These reviews will help us reach a decision about whether to continue the new hours past the pilot term. We look forward to hearing from you and hope you enjoy the new flow of things. Now day’s traffic flow become one of the serious problem. After my office time on my way to home, there is large number of traffic on road. For controlling flow of traffic major steps should be taken. This post addresses the issue of traffic flow; it is a good effort to educate us.